V-ME is all about Día de los Muertos! So I've found your Washington State resource for all things Day of the Dead: V-Me, the Spanish-language public TV affiliate through KCTS. Heck, they've even got a recipt for Pan de Muertos! Yum. PERSONAL NOTE: I am really excited because my Sacramento-based nephews are now tuned into V-Me and its fantastic kids' programming. Five-year-old Aaron exclaimed, "This is the BEST because it's in SPANISH!" >>V-Me will be hosting live updates, interviews and policitical banter en español 4-10pm on Election Day 11/4. Peruvian Shamans at Work on U.S. Presidential Candidates! I try to stick to local stuff, but this was too good to pass up. 1) Shamans in Lima are working their magic to provide for a fair presidential election in the U.S.
2) They have predicted that Obama will emerge the victor. Hi - just an update to the Global Partnerships Business of Hope Luncheon. Even in our less-than-ideal economy, 1200 people showed up at the fundraiser and between them and the sponsors, the organization raised $560K to help individuals start and expand their own businesses in El Salvador, Nicaragua, Guatemala, Peru and Bolivia. Next up for Global Partnerships? Mexico and Ecuador. 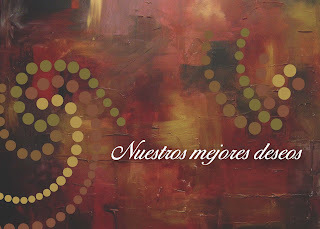 At Conexión Marketing we wish them all the best in spreading prosperity! 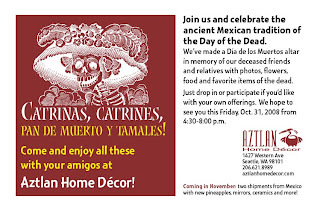 Tomorrow join our friend Antonio López at his wonderful shop, Aztlan Home Décor, just down from Pike Place Market. He's been importing beautiful artisan work from Mexico, and doing it in a way that directly benefits the artists themselves! This is a fabulous place to find that unique gift, or even a museum-quality piece. We shopped at Aztlan when we were decorating our office, and always get compliments! It's going to be fun - enjoy Day of the Dead Bread (one of my faves) and tamales - and meet one of the coolest shop owners in town. In Phinney Ridge??? No way, José! When I think Phinney Ridge, I think of Red Mill Burger (where even the Garden Burger is delicioso), or Woodland Park Zoo. It's a terrific residential area. But Phinney Ridge has a new face for me, now that they're putting on a celebration of Día de los Muertos! Friday, November 7, from 6:30 - 9:30pm, you can enjoy a procession, music, poetry--and of course, sugar skulls and chocolate caliente! I just received the best set of tips, from Beatriz Bonnet and our friends at Syntes Language Group in Denver, Colorado. I'm including an excerpt here. Identify your audience. The US Hispanic population is extremely diverse and encompasses natives of all the Spanish-speaking countries plus part of the US-born first generation of Hispanics. It includes all races and socio-economic backgrounds as well as many different cultures and sub-cultures. Therefore, translating for a mass market audience requires a different approach than translating for a restricted, more easily identifiable audience. If a construction company, for instance, hires only workers who are originally from Mexico, it is easy to tailor the translation of a safety manual just for them and write it in “Mexican Spanish.” On the other hand, if a consumer goods company, for example, is trying to reach the widest possible market and is advertising through mass media, then the most neutral Spanish possible is needed to appeal to all the Spanish speakers in the United States and, most important, in order not to offend any one constituency. In addition, defining the audience in terms of demographics will help to determine the style used in the translation, as well as such factors as whether the formal you (usted) or the informal you (tú) should be used. Thanks to Beatriz Bonnet for this fantastic introduction for anyone looking to appeal to Spanish speakers in the U.S.! The City of Seattle is recruiting Latino youth for the Mayor's Youth Council. The MYC application deadline was a couple of weeks ago but there were no applications from Latino youth. Please help recommend Latino youth and/or encourage Latino youth to apply for this leadership opportunity. Applications will be accepted through this week. WHO: Mayor's Youth Council (MYC) is comprised of twenty high school-aged youth between 15-19 years old who represent Seattle's thirteen neighborhood districts. WHY: Mayor Nickels and other city leaders want youth input on neighborhood issues, city projects and policies. Gain skills and knowledge: Participate in ongoing trainings to build leadership skills and knowledge of civic engagement. Youth voice: Discuss solutions to community issues and make recommendations to the Mayor. Learn about city government: Hear from Mayor Greg Nickels, City of Seattle staff and department directors. Organize youth events: Host the Mayor's Youth Town Hall and Youth Community Meetings to discuss important community issues impacting youth today. WHEN AND WHERE: The MYC meets 2-3x per month on Thursdays from 4 pm - 6 pm downtown at Seattle City Hall (600 4th Avenue, between James Street and Cherry Street) October through May. Special events will be held at various places throughout the city. COMMITMENT AND EXPECTATIONS: Council members are expected to attend all meetings, events and a mandatory one-day retreat on Saturday, October 25th 10 am - 6 pm. Missing more than two meetings/events may result in removal from the Mayor's Youth Council. In addition to meetings, members will be expected to dedicate an average of 10 hours per month to projects. "Connecting people, communities, and government." Well this is cool - Rebecca Nelson, a senior at Auburn High School, was selected as a National Hispanic Recognition Program Scholar! She was among 5,000 students selected out of a pool of more than 200,000 Hispanic/Latino high school students who did well on standardized tests as well as held a GPA of 3.5 or higher. The National Hispanic Recognition Program was founded in 1983 to recognize students like Rebecca and to share information about these motivated, talented students with colleges and universities. Come visit Venezuelan Valentina Vitols (say that three times fast) and her new SODO studio. She's hosting an afternoon of coffee and Macrina treats for grown-ups, and photo playdates for the kids. Where? 1943 1st Ave S, Suite 2D in Seattle (98134). 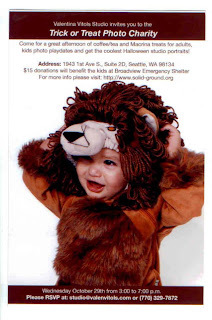 $15 donations will benefit the kids at Broadview Emergency Shelter. Centro Latino has been working with Tacoma Art Museum to produce a stunning Day of the Dead event, four years running. This year's tapete (a large sand mural) contains 2,000 pounds of sand, and local celebrated artists and volunteers worked together to create a temporary work of art. What's super-cool about this link is that, at the bottom of the page, you can watch last year's tapete in its process of creation. It's an amazing tradition and I invite you to take a look, and visit Tacoma Art Museum this coming weekend! The celebration ends with a celebration from noon to 6pm on Sunday, with traditional music, dance and food. All this talk about Day of the Dead this month, and my thoughts keep returning to my stepsister April. April Carlson was a beautiful woman with a smile everyone remembers. She and I went to Vancouver BC together, to INXS and U2 shows, dined at Capitol Hill restaurants, and went dancing. We texted every day and spent hours on the phone. She was a great friend to me. The last thing April did on October 15, 2006—before calling family because she had trouble breathing—was clean her bathtub. We know she was using Drano. It’s possible that it mixed with another cleaner used either by her or the building maintenance staff, or simply that ventilation wasn’t sufficient. I asked my doctor about this, and he mentioned being aware of multiple cases in which patients had died after mixing cleaning agents. Common examples he gave were combining bleach with vinegar, ammonia, or cat urine (in the case of cleaning out a litter box). All three combinations can produce a deadly gas. While we’re not certain this caused April’s death, I’ve since shared this important information with a lot of people and most of the time the response is surprise. That tells me that more people need to hear this message. · Read household cleaning product instructions. · Do not mix your cleaners! · Keep rooms ventilated when cleaning. · And if you’re ever feeling faint, or your throat and nostrils begin to burn, pick up the phone and dial 911 immediately. April was just 37 when she passed away. I’ll remember her fantastic sense of humor and her love of Ireland, mystery novels, bread pudding and British actors. And I’ll never forget the special way she had of making me feel great. Rose Cano and team are also unveiling 09 plans at an event starting 11 am this Sunday, October 26th at Langston Hughes Performing Arts Center, where you can see videos of their projects and give input into future endeavors for the group. Coffee and pastries will be served. This group was awarded the Large Projects Grant from the Department of Neighborhoods - pretty cool. I'm looking forward to seeing the production of Callejón next June! Did you know there's a growing business right in in Pioneer Square that's devoted to the Spanish language and literature? Maria Victoria and Paula Taylor co-own House of Writers / Casa de Escritores, a thriving literary hub (casa) committed to the use and enjoyment of the Spanish language through literature. Check out www.houseofwriters.com to learn about their literature and creative writing workshops and other opportunities. And for current info about what House of Writers / Casa de Escritores is up to, subscribe to their blog: http://houseofwriters.blogspot.com. I want to tell you about a Seattle woman named Sandy Kemper because I think her cause is outstanding. 3) elevate entire communities, by getting individuals out of poverty who then inspire others. Sandy's hosting the 7th Annual Live and Silent Auction Dinner, called Dancing with the Latin Stars, and featuring terrific Brazilian musician/dancers. Penny LeGate is MCing. It's on Saturday, November 1st at the Edgewater Inn starting at 6:00pm and costs $70. Please please please consider a night out to help this amazing work Sandy and her team are doing! 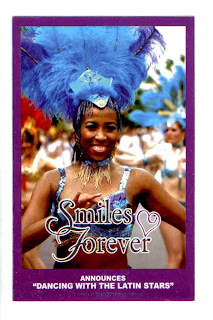 The site is http://www.smilesforever.org/ but it's a work in progress and there are no ticket sales for this event through the site. If you can't attend the event, please consider donating directly to Smiles Forever. LATIN CAREER EXPO: an event coming up next week that targets Latino/bilingual job-seekers! According to a Puget Sound Business Journal update I just received, our state's unemployment rate fell to 5.8 percent in September from August’s 6.0 percent level. But somehow it doesn't feel like it! This event is just what Latino job-seekers are looking for. If you go, please post a comment describing your experience! We're just one week away from the Business of Hope Luncheon, an annual fundraiser for Global Partnerships, only our very favorite local microcredit organization! They're busy in countries like El Salvador, Nicaragua, Guatemala, Peru and Bolivia, helping women start their own businesses, become self-sufficient, support their families and communities, and achieve their dreams through microloans. It's a proven system and has amazing results! At each annual luncheon, we get to meet another microcredit recipient whose life has changed thanks to the good works of Global Partnerships. I urge you to check out this organization and join the luncheon Tuesday, Oct 28 at 11:30 at the Westin. This is a special cause. While it's not local, I think it's an important one. I invite you to take a look at http://www.donorschoose.org/donors/proposal.html?id=189127 and see if you agree. You see, there are approximately 44 million Latinos in the States, but not all of them are truly fluent in their families' language. And it's a popular misconception that Latinos who can carry on a conversation in Spanish can also write well in the language. Many Latinos who grew up here didn't actually study Spanish in school; instead, they picked up colloquial material at home with los papás. That works great in conversational settings, but if these Latinos are hired as bilingual employees, they may lack when it comes to reading/writing the language. This teacher needs just $155 left, within the next month, to reach her goal of distributing dictionaries for her Heritage Spanish students. Every little bit counts! >>If you agree this is a neat way to help, please forward this post to others you think might want to reach out. Conexión Marketing is mourning, because the artist who created the beautiful painting that hangs in our office (and from which we created last year's holiday card) is closing his Capitol Hill gallery and consolidating in San Francisco. Warren Knapp Gallery has lived on my street for years, and I'm going to miss peering in at the artwork on my way to Bauhaus for coffee. SILVER LINING: There's a sale! A tremendous sale, actually, on all the original paintings at this location! Today, tomorrow and Thursday from 6-9pm stop by 1530 Melrose Avenue for amazing savings on Warren's great pieces. For example, you can get a 48"x 60" painting for just $250! Check out his site for examples of what's in store: http://www.warrenknapp.com/. Adiós, Warren. You'll be missed! There's a fabulous opportunity for someone with unique qualifications, including bilingual ability (English/Spanish) and agency experience. See below for more info from the recruiter. passionate about mobile marketing! Is that you? If so, read on. feedback and make adjustments as needed. disabilities or special needs to perform the essential functions. Yeah, another typo has reared its ugly head on my blog. Those of you who know me personally realize how mortifying this is for me. Good thing I have sharp readers who alert me to all my mistakes. Gracias a todos. Support Nicaraguan Artisans and Get 25% Off! 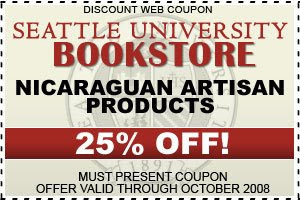 OK, I'm promoting not only the good that my university, Seattle U, does for people in countries like Nicaragua, but also a fantastic opportunity to save 25% on your purchase of a unique, handmade pottery item. They're on display right now at the Seattle U Bookstore, on campus. Seattle U has been partnering with the University of Central America to import fine artisan products. That partnership helps provide microloans and business training to the participating Nicaraguan artisans. Orders placed for these products are coordinated by Nitlapan without any governmental or corporate intermediary – when you purchase these you are essentially dealing directly with the artisan. >>Nicaraguan artisan products make great gifts in the spirit of compassion. OK - this it NOT an official Day of the Dead event! And certainly not an official translation (which instead of reading "Day of the Dead [Ones]" reads "Day of Death" but with an atrocious grammatical error. Whoops! And who is DJ King of Pants? ¿El Rey de los Pantelones? Oh, dear! But this image DID get your attention, ¿no? In real Day of the Dead news - Seattle's official celebration takes place November 1-2 down at the Seattle Center. Altars, sugar skulls, y mucho más! For more info please visit http://www.tallermexicano.org/. Typically there's a counterpart celebration down south, in Tacoma. When I hear more about that one, I'll post. Last year we celebrated with a special party at Conexión Marketing offices downtown, which attracted way more people than we could fit (thank goodness for the hallway, which made for a scalable party)! Good times. This year I'm heading over to others' parties instead. Hello, All - I'm off to Eastern Washington this weekend. Spokane, to be specific. There are lots of people right now thinking, "Ah, so devoted to her work!" You know, because Eastern Washington in itself is a Hispanic market. Not so fast. Yes, there are several very concentrated groups of Latinos throughout Eastern WA - namely in Yakima and the Tri-Cities - but Spokane is like an oasis in that landscape. It's very white. Or as they say in Censusese, "white non-Hispanic." Also, this might be an opportune time to point out that there are actually MORE LATINOS IN WESTERN WA than east of the mountains. This is true! The difference is, they're less concentrated, more integrated in the Puget Sound region. This might also be a good time to mention that the markets east vs. west are entirely different. As examples, generally Latinos in the Seattle area are better educated, have smaller households, and be more likely to be bilingual. They are also more likely to be from South America or Spain their their east-of-the-mountains counterparts, who are mostly Mexican, with some Central Americans. We'll talk about Central WA some other time. Enough preaching! Enjoy the weekend. The CASA Latina Gala. 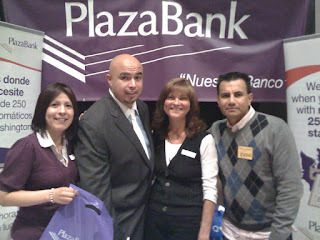 The Latino Entrepreneur Fair. The Two Vaults Gallery exhibit. etc. etc. Or maybe just a nice relaxing weekend at home. OK, OK - I would call myself an expert proofer (in fact, I'm considered a professional because people pay me to do it! ), but I must confess that I just sent out an email to fellow professionals with the typo "Hipsanic." Nice. And that made me wonder: Have I made that same mistake here? This is one of those commonly made typos for me, like wiht, or form. 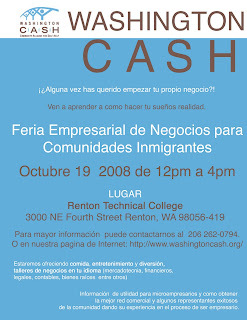 Sunday, October 19 -- Washington CASH is putting on an entrepreneur fair at Renton Technical College, from 12-4. This event targets Spanish-speaking immigrants who have started their own businesses or are looking into becoming business owners. There will be workshops to focus on relevant topics of business: finance, accounting, legal, marketing, real estate, etc. Several groups are participating in this, including Community Capital Development, SBA and SCORE, and Plaza Bank. And - organizers say they're serving up not only food but also entertainment! How can you refuse? For more info: http://www.washingtoncash.org/. Thought I'd pass this one along, since this organization invests in the well-being of Washington State Latinos. You won't want to miss this opportunity to participate and work across sectors (business, academic, government and non-profit) to strength the Latino/Hispanic community leadership. **The Latino Community Fund is a Public Foundation created by Latinos to invest in the well being of Latinos in Washington State. Two Vaults Gallery in Tacoma is featuring a Day of the Dead exhibit, including local artist Chanda Castillo who we just LOVE. 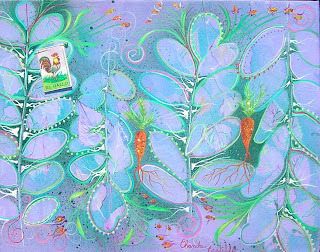 (The above art is also a Chanda piece, although not part of this particular show.) The exhibit opens this Thursday, October 16 and runs through month and into November. There is an opening reception this Thursday in conjunction with the Artwalk, which will include wine and apps. I invite all to make the trek to Tacoma! Visit http://www.twovaults.com/ for more information about the show; see http://www.twovaults.com/artists/castillo/castillo.htm for a sampling of Chanda's amazing creations that will be featured in this special show! I've always enjoyed the articles in ColorsNW and was really sad to hear this summer that they were discontinuing their quality printed magazine, so I'll be watching this site and its content. Please comment on it, too, anytime! Last Thursday evening I enjoyed the Univision Upfronts at Fisher Plaza, with our hosts the KUNS sales team: Rich Roberge, Violeta Alano, Teresa Jones and Harold Avelar. It was a lovely event and great people there, but I think it may have been overshadowed by last year's grand Launch Party. Turns out, I was in Spain at the time, right after the network affiliate launched here in Seattle, and just before its weeknight newscast went local. Apparently I missed THE party--big crowd, dancing, a real party. This time it was much more subdued, say those who attended both. We heard from a band I think was called New Age Flamenco, a guitar-strumming duo that were really terrific (especially enjoyed Hotel California). What was a little surprising was the music between sets was....(drumroll)...Gypsy Kings! Yes, the band from France. A decades-old recording. ¿Cómo? We have sooo much wonderful talent (and/or Grammy winners and/or club favorites) on the Latin music scene; I wondered why none of those were selected. But all in all the event was wonderful; I met some new folks, a nice mix, whom I will be contacting (some have already followed up with me -- ¡gracias!). Saw many familiar faces, too; people who have been around and continue to be an integral part of this community. Newscaster Jaime Mendez wasn't there (bad back), but it was great seeing the sales team out of their regular environment and they are some cool people. Everyone was introduced to the Fisher executives, and to the coming seasonal programming on 51 over-the-air (for me, stuck with Millenium-turned-Broadstripe Cable, KUNS airs on Channel 16). In the national portion of the video we saw, they tried to tell us that novelas weren't just soap operas, they were adventure! Love! Exotic places! Guess I'll have to tune in to more than Jaime's newscast. I failed to mention another interesting update in Washington state Hispanic media, which was just announced in the current issue of Tú Decides, the bilingual newspaper that earlier this year made its way over the mountains to Western WA. Edgar Martinez, CEO of Branded Solutions by Edgar Martinez. Craig Gaylord, founder and owner of Fiesta Foods in Eastern Washington. Albert Torres, founder and CEO/Publisher of Tú Decides Media, Inc.
Ismael Campos, founder and Vice-Chairman of tú Decides Media, Inc. So it appears that this relatively new publication is stronger than ever. What impressed me was the involvement of non-Latinos in the future of Tú Decides. The company's deal with The Seattle Times, to include Tú Decides in Times issues going to Newspapers in Education, should take effect in the coming months. 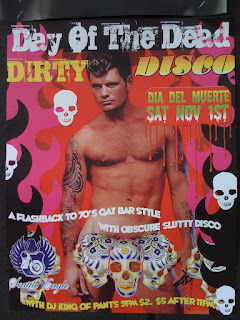 OK, so we've shared about Radio Sol, ahem, EL REY. It's generally the same format but a new name/new management/new DJ. Tune in to 1360AM. The latest at El Rey is that longtime Radio Sol sales guy Edgar Solares has moved to El Mundo, our area's oldest respected Spanish-language newspaper out of Wenatchee, which serves western and central WA. So for all your western Washington El Mundo ad deals call Edgar! He's a great guy and really takes care of his clients. >>Or just call us, and we can direct you to the best in the biz and help you with your creative as well! Onfe has changed its name. We think it's now Onfe Home Loans. Onfe Foundation is the new non-profit created by the same Onfe team. Mission: Development of financial education and information to creating sustainable prosperity and strengthening of America through both local community events targeting families and individuals as well as small business entrepreneurs. (as it appears on their website) Oh and longtime local musician (think: Bochinche) Eddie Quintero serves on the Board. Onfe Founder and President Gustavo Montoya has purchased El Mundo newspaper from Jim Tiffany and Carlos Rossetti. I say "por fin" (finally) because the event took place this past Sunday, but I'm just now getting to this post. Ah, the life of a socialite....I mean student. I also say "por fin" because it's about time the Seattle area has an event of this scale that's dedicated to professionals. 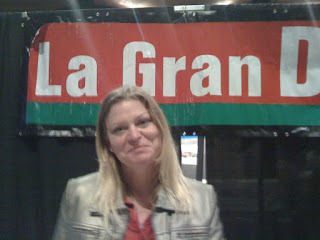 The Latino Expo (aka the Latino Consumer, Business and Career Expo) at Meydenbauer Center was a pretty big event, as it turns out. This I believe is Expo NW's first event of this type in Western Washington (correct me if I'm wrong), although they've mastered it in Pasco! They sold out all the exhibitors' booths and had an interesting combination of banks, schools, insurance carriers, cookware, jewelry, and and and the list goes on. It was hard to know whether I should apply for a job, enroll in school, or get car insurance. I think if the event were more focused (or somehow categorized) it might be more meaningful to attendees and bring more of the exhibitors' target to the event and to their booth. All in all, I was happy to see that there was indeed some attendance there (including some of my favorite people) and I know that with more events in our area, Expo NW will see success with their well-planned events. Tuesday, 10/7, 6 pm V-me will simulcast the debate between candidates McCain and Obama with live Spanish interpretation. Secrets of the Dead: Aztec Massacre 8 pm: By analyzing codices and using forensic science, this program rewrites much of what we thought we knew about the Aztec reaction to the Conquistadors. Latinos ’08 9 pm: Latinos will play a growing role in American politics this fall and beyond. Join acclaimed director Phillip Rodriguez (Brown Is the New Green: George Lopez and the American Dream) for a cutting edge exploration of the diversity, unpredictability and growing power of Latino voters. Los Lonely Boys: Cottonfields and Crossroads 10pm: Following the Garza brothers out of rural West Texas, award-winning documentarian Hector Galán follows the rise of Los Lonely Boys from humble beginnings to fame and critical acclaim as some of rock’s freshest innovators. A Quest for Home: Latino Artists in Seattle 11:30 p.m.: Longtime Northwest producers of national Univision programming Mario Zavaleta and Martha Sanchez connect with our region’s Latino artists, musicians, writers and dramatists to explore the emergence of a vibrant new art scene. Check www.KCTS9.org for more information. Man, that was a great Hispanic Chamber Gala! Saturday night's gala was a great event, well attended with lots of good networking, an inspiring address from our Governor as well as one from the Republican gubernatorial candidate, some well-deserving people getting awards (no one at my table was sure how one becomes eligible for this honor), the food was phenomenal, and on and on. I thought it was super-cool that Cris Guillen was recognized for the commitment he's shown to the Chamber and to pulling all the Washington State Hispanic Chambers together as one association. He literally quit his job to take on that task and his accomplishment was celebrated at the Gala. But it became really obvious that this event was (with the exception of Chris Gregoire) all about men! Everybody on the new Association of Washington State Hispanic Chambers of Commerce Board of Directors and all regional Chamber leaders--men, all of them! All three award winners? Men. That was more than a little disheartening, especially since I have personally chatted with many successful businesswomen (Latina and otherwise) not only at that event, but throughout the year at King County Hispanic Chamber of Commerce events. Are we not leaders? What's going on? TGIF - the week's PSBJ has come out and with it, a great local focus on banking (how timely!). 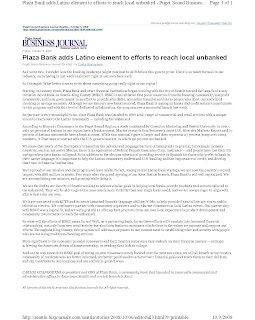 And ... Don't miss the op-ed piece from Carlos Guangorena, president and CEO of Plaza Bank, the Northwest's first Latino bank. >>The article focuses on a new City of Seattle initiative, Bank On Seattle-King County, to reach the unbanked population here locally. It's an initiative that's taken off in San Francisco, and we think it will here, too. If you're not a subscriber and would like a PDF of the article, please email us at info@conexion-marketing.com. CONGRATULATIONS to our own local photographer extraordinaire, Hugo Ludeña. He earned one of this year's prestigious Mayor's Art Awards, presented by none other than Greg Nickels. His talents are featured monthly in Latino Cultural magazine, and he was in last month's City Arts magazine. Local Boy Makes Good! I wouldn't be doing my job if I didn't tell you a little about this weekend's events in the Latino community. So I'll do my job! The 2008 Annual Gala Dinner of the Association of the Washington State Hispanic Chambers of Commerce is this Saturday evening! That's October 4 at the Meydenbauer Center, with reception at 4:30 and dinner at 7pm. Not only will AWSHCC winners Edgar Martinez, Gil Kerlikowski and Dennis Basford be present, but we'll have both Washington State Governor Chris Gregoire AND the Republican candidate for governor Dino Rossi kick off the event with a welcoming address. Together? No creo. CASA LATINA 2008 GALA DINNER & AUCTION will take place Saturday, October 18. CASA Latina is a locally based organization that empowers Latino immigrants through educational and employment opportunities. In case you weren't aware, CASA stands for "Centro de Ayuda Solidaria a los Amigos." A-ha!